Plums, plums, everywhere plums. That’s what I’m seeing in the farmers’ market now and that’s what I’ve been seeing on trees in my ‘hood. So I’ve been foraging and making jam and eating as many as I could out of hand. Still, I had so many dang plums, I needed another way to preserve their flavor. Enter: Slivovitz. Yes, slivovitz, a word I’d never heard before. 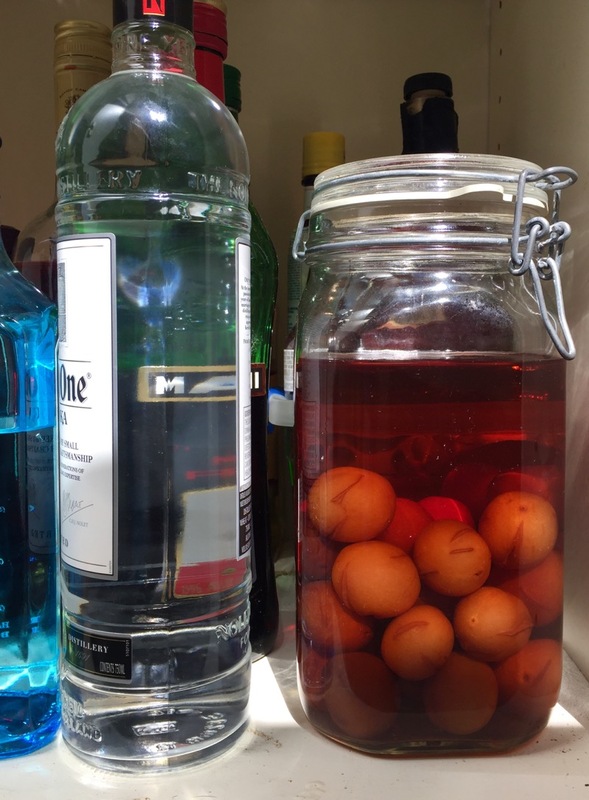 It’s an Eastern European plum brandy that I found on the Washington Post website, based on a recipe by Cathy Barrow (aka Mrs. Wheelbarrow). It’s the easiest preserving project I’ve ever done (and would make great holiday gifts if you have a ton o’ plums). The only trick is to use smaller, firmer plums, not big, juicy grocery-store plums for eating. I used small rosy ones, but purply Italian prune plums, coming on strong now, are probably the best for color. Note: I used a 1-liter jar. Use whatever large glass container you have; if you don’t have one that fits perfectly, use two; and don’t worry about a little air gap (it’s booze! it doesn’t go bad). Eventually you will strain the liquor into bottles; you might want to keep the empty vodka bottle around for that. Recipe adapted from Washington Post. Rinse plums and slash each one with a sharp paring knife to expose the flesh. Put plums in a sterilized glass jar(s) with a top that seals tightly. Add sugar, cinnamon stick, and lemon peel then pour in vodka to reach the top (set any extra aside for a cocktail). Close top tightly and leave on counter for 2 weeks, turning jar over each day until the sugar dissolves (place the jar upside down on a pie plate to catch any leaks so you can pour the liquid back in). After 2 weeks, transfer the jar to a cool cupboard and let sit for 3 months — be sure to put a label or Post-It note on the jar marked with the date it will be ready. When the brandy is ready, strain into a bottle or bottles (8-ounce ones make nice gifts!) and discard the plums. Store brandy in the liquor cabinet, or better yet, in the freezer. Pour shots and serve plain or with vanilla cake or sugar cookies.